Doll-house kitchens may be cute when the matron is a three-year-old serving tea to Raggedy-Ann and a teddy bear. But by the time you�re old enough to own a home, you need a grown-up size space to make real meals for the family. In the days before the modern open concept became the d�cor du jour, many homes had the kitchens tucked away into small and awkward spaces. �Generally speaking, when you�re looking at smaller kitchens, you are looking at an older home,� says Paul Bilyea, a designer with Cardinal Kitchens in London, Ont. While today�s builders are creating this space as part of the living area, 30 or 40 years ago it was given less weight and often put off to the side, he says. 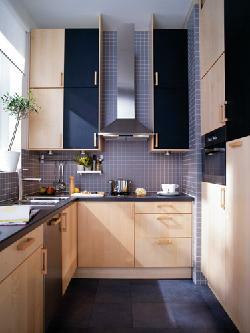 Now, residents of those homes are looking for ways to renovate the tiny space into a viable 21st-century kitchen. It�s a tall order for any designer. Most agree that the small spaces are by far the most challenging projects they come up against. So how does one maximize working and storage space in these Lilliputian kitchens? Each designer has a personalized set of strategies and tricks of the trade, all which offer hope for the frustrated homeowner. But, there are almost as many opinions and strategies as there are homeowners looking for a makeover. But aesthetics is also important and, here, there are differing opinions. In addition, he says, use little details throughout to create focal points � molding selections, hardware for doors and drawers, textures for backsplashes, even layering lighting � which can draw attention away from the smallness of the space.